Net sales amounted to SEK 288 M (336). Net sales adjusted for change related items were SEK 288 M (336), which was a decrease of 14%. 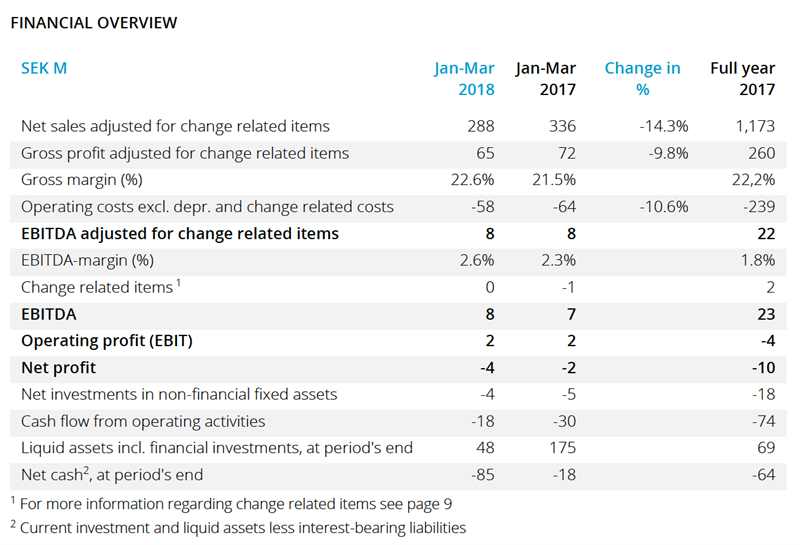 Gross profit adjusted for change related items was SEK 66 M (72), a decrease of 10% or 13% adjusted for changes in exchange rates. Gross margin adjusted for change related items was 22.6% (21.5). Operating costs excluding depreciation and change related items were SEK 58 M (64), a decrease of 11%. EBITDA amounted to SEK 8 M (7). Adjusted for change related items, EBITDA was SEK 8 M (8). Capitalised expenses for product development were SEK 4 M (5). Cash flow from operating activities was SEK -18 M (-30) and the sum of cash and interest-bearing financial assets was SEK 48 M (175) at the end of the first quarter. Net cash in the first quarter decreased by SEK 21 M to SEK -85 M.
Earnings per share, before and after dilution were SEK -0.08 (-0.04). In March Tradedoubler announced a tender offer and a written procedure of its outstanding bonds due 2018. The final result of the tender offer and written procedure was announced in April where the request received acceptance by 100 per cent, approx. 96 per cent of the adjusted nominal amount participated in the written procedure and approx. 95 per cent of the adjusted nominal amount did also tender their bonds. Payment to the bondholders were made on May 16 2018. In May Tradedoubler signed a new financing agreement with a Swedish credit institution of SEK 71 M consisting of a loan of SEK 60 M and a working capital facility of SEK 11 M. In addition, the company entered into a loan agreement with its principal owner Reworld Media S.A for SEK 40 M. Tradedoubler also announced that conditions are examined for a preferential share issue in the nearer future. “The first quarter 2018 was characterized by two main topics – re-financing of the company and growth focused operational work. The financing in the form of long-term loans on market conditions from two lenders of which one is the largest shareholder of the company gives Tradedoubler long term stability as well as the flexibility for investments into the business in the future. The agreement that was found with bond holders during the tender offer process means a substantial financial improvement for Tradedoubler. In operations we closed the quarter with an EBITDA result of SEK 8 M which is on the same level as in Q1 last year despite a further decline of gross profit of 13%. It is the seventh consecutive quarter with a positive EBITDA result. The decline on revenue and gross profit is solely linked to the losses of a number of larger clients at the end of 2016 and early 2017 and the active closure of unprofitable programs formerly managed in Telford during the same time. The increase of our gross profit margin to 22.6% is partly due to these losses too. Another contributor is our focus on performance marketing solutions which influences our margins positively. Operational costs as well as capitalized expenses for product development are significantly lower than last year which is due to a lower number of headcount but as well a result of various efficiency projects carried out in the last two years which are all finalized by now. This information is information that Tradedoubler AB is obliged to make public pursuant to the EU Market Abuse Regulation and the Swedish Securities Markets Act. The information was submitted for publication, through the agency of the contact persons set out above, at 08.00 CET on 23 May 2018. Numerical data in brackets refers to the corresponding periods in 2017 unless otherwise stated. Rounding off differences may arise.